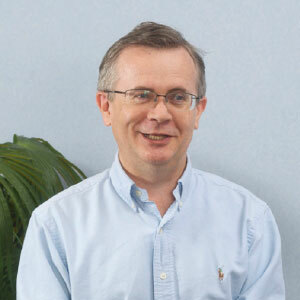 Colin is our expert on aluminium pretreatments, coatings and lubricants. With a PhD in Polymer Science and almost 30 years’ experience, Colin knows a lot about polymers and coatings on aluminium. His product experience encompasses painted sheet, foil, packaging and automotive applications. Many of the cleaning and pretreatment systems on the market today were originally developed for steel. Thankfully, Colin and the Materials Development team have a thorough understanding of how these treatments can be optimised for aluminium. Colin was a key member of the team that developed formability and pretreatment solutions for Jaguar’s first all-aluminium car. Outside of work, Colin has a passion for playing the piano and would one day like to see it re-introduced as pub-based entertainment.